New Music Matters: The Octopus Project Releases New Single "Whitby"
How much love can I show for Austin-based band The Octopus Project? Their new single off a yet-to-be-named album for 2013 provides a solid romp into their unique world of indie-electro pop instrumentation, while the accompanying video is also a creative wonder produced by the band. The song "Whitby," available on iTunes and other digital channels, is at once funky and fun right from the start, with some lovely melodic vocals by Yvonne Lambert. In the video, abstract shapes designed in Photoshop then formed utilizing a scrapbook cutting device and then photographed in a series of real world settings. This amounted to 4,000 images total, no small undertaking. Peek-A-Boo Records calls the result "a product of The Octopus Project's collective consciousness." The record label is also offering an extended download with bonus tracks at their website (grab it now complete with B-sides and Karoke version!) 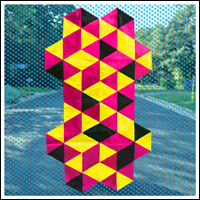 Their last album, 2010's Hexadecagon is worth a revisit as well as their other recordings, plus my interview from Moogfest 2010 when they were tapped to be the backing band for Devo here.